Our range of products include wind meters and waterproof chlorine meters. Field tough design - accurately detect even the lightest winds with this Digital Mini Thermo Anemometer. Essential for pesticide application, controlled burns, and other wind-sensitive applications, this compact anemometer and temperature meter provides digital accuracy to ± 3% in the field. Tough and affordable, the Mini Thermo Wind Meter measures MPH, M/S, KM/H, Knots,FPM, Avg/Max speed and temperatures to 122°F. C/F switchable with Range of 1.1 to 62.5 mph. Waterproof, fully floatational design. Features auto power off, wind-chill reading, and field-replaceable propeller. Includes 400-hour CR2032 battery, lanyard and protective case. The Mini Thermo Wind Meter is also ideal for power and sailboat, hang glider, hot air balloon, and other air-related activities. 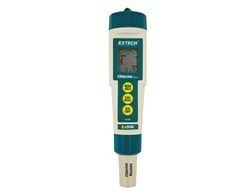 We are offering Waterproof Chlorine Meters that are fast and easy to use and are user-friendly. Using waterproof, rugged housing and flat surface, we manufacture this product in compliance to set industry standards. Our supervisors keep a tight check on the quality and manufacturing of the product on time. Optimum quality material sourced by our vendors, are used to manufacture this product. The price range is very affordable as compared to the other meters.